David Ferrer didn’t quite defend his first Masters title at the Paris Masters this week, falling in the final to Novak Djokovic. But he wasn’t far off, and came considerably closer than most believed he would. This is not to diminish expert opinion, but merely to laud Ferrer’s endeavour. There were plenty of good reasons to suppose he would not reprise his efforts from twelve months ago. Despite his lofty number three ranking, his form has been inconsistent this season. 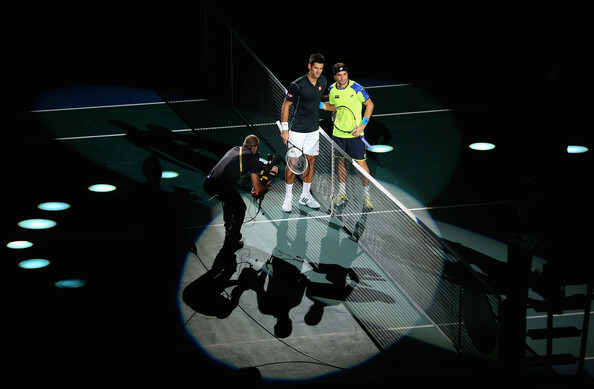 The Bercy draw was not only much stronger this year, but all the best players were unusually committed – all top eight seeds reached the quarterfinals – eschewing the common practice of offering a token appearance before absconding for London. History also provided no comfort: no one has ever won consecutive titles at the Paris Indoors. For these reasons, and others, I’d suggest Ferrer’s efforts this year have exceeded last year’s, for all that his greatest title ultimately fell undefended. Ferrer’s defiance of common expectation has to some extent defined the European Indoor season this year. In Stockholm he defied the widespread assumption that he’d easily account for Grigor Dimitrov, given the Spaniard’s hitherto cherished role of keeping upstarts in their place. In Valencia he overcame the advantages of a slow court and overwhelming home crowd support to lose to Mikhail Youzhny. In Paris he defied expectations that he’d lose early in the tournament, or easily in the final. There is little chance that he’ll win the World Tour Finals next week, so pencil him in for that one. Last year Ferrer won the Paris Indoors without contesting a match in which he wasn’t the strong favourite. For a diminutive claycourter this was an unlikely scenario, since aside from the World Tour Finals, Paris is the sport’s most prestigious indoor event. Sam Querrey and Michael Llodra had thoughtfully cleared any impediment on his way to the final, and once there Ferrer discovered that Jerzy Janowicz had usefully obliterated the other half of the draw. This year he enjoyed no such favours. In the quarterfinals he faced Tomas Berdych. Admittedly Ferrer boasts a strong record against the Czech, even on this surface, including comprehensive thrashing in last year’s Davis Cup final in Prague. But Ferrer’s form, as I mentioned, has not been stellar this season, and he has recently developed a knack for losing important indoor matches to aggressive shotmakers. In the semifinal he defeated a curiously downbeat Rafael Nadal in straight sets, a result that I hadn’t believed to be more than theoretically possible. The hardcourt head-to-head between the two top Spaniards was admittedly 3-3 before this match, but two of Ferrer’s victories came six years ago, while the other was in the 2011 Australian Open quarterfinals, when Nadal could barely move. Nonetheless, Ferrer performed with quiet magnificence, enough to take advantage of Nadal’s off day. In the final he insisted he played even better. The highlight was the stone-dead dropshot winner with which he claimed the tournament’s longest rally. It is rare Ferrer to be described as a genius, but the commentators were entirely justified in doing so there. Perhaps we should be quiet while he works. Nowhere is it decreed that easy titles count for less, although some insist otherwise, concocting complicated metrics whereby we can waste time measuring one player’s achievements against another’s. There’s such a thing as an honourable loss, although no one would confuse it for a win. I’ve no doubt that Ferrer, if given the option, would choose a comfortable run to a Masters title over a heroic slog that falls just short. He doesn’t shirk toil, but that doesn’t mean he necessarily prefers hard times over an easy ones. It is therefore ironic that he so consistently makes his own life harder than it needs to be. The Bercy final proved to be a valuable illustration of this. He lost in straight sets, yet served for each of them. In both cases he saved his worst tennis for late in the set, although Djokovic played a large role in that, characteristically lifting precisely when circumstances required he must. There is no shortage of broken-hearted opponents who can testify to the Serb’s sense of timing, nor his immaculate focus in parlous situations. Until he needed to be, the Serb was rarely at his best, and certainly nowhere the level he displayed against Wawrinka in the quarterfinals, or against Nadal in Beijing, let alone the consummate flogging he visited upon Ferrer back in Melbourne, or myriad other cruel beatdowns he has delivered this year. Despite that, Djokovic afterwards claimed he was playing his best tennis of the year. Perhaps he was speaking in general terms. Unquestionably he is playing better than everyone else right now. In his current winning streak of seventeen matches he has beaten every other player in the top ten besides Andy Murray – who has a great excuse – and Berdych, against whom Djokovic no longer need prove anything. Today it was understandable that his mind might be elsewhere. Yesterday he won a tough semifinal against Roger Federer, and must immediately ford the Channel in order to play him again on Tuesday. There is thus no opportunity to savour his second title at a venue that has in recent times known few repeat winners. The last multiple champion in Bercy was Marat Safin in 2004. There was barely time to play with his new trophy, which is some kind of tree, and different from the old trophy, a modernist homage to tangled wreckage. I missed the old Masters shields. This would have been Djokovic’s sixteenth Masters shield, and third this year. Next week he’ll attempt to win his third year end championships. Even if he does – he is the favourite – he almost certainly won’t finish the year at number one, since for Nadal to do so he must win only one match in London, and has been drawn in a round robin group that could be purpose-built to ensure precisely that. When Nadal recovered the top ranking after Beijing I had supposed that the gap between him and Djokovic would widen considerably before it closed. That is probably still the case, since Nadal has nothing to defend until February, but Djokovic has done everything he feasibly can to remain as close as possible, with ‘everything he feasibly can’ here defined as not losing ever. He has defended every title he already held, and now added the Paris Masters, a display of defiance that must reduce even Ferrer to envy. I can’t think of anyone else who so consistently raises their game to a new level when down at the end of a set. It’s one thing for great players to hold their own serves when trying to stay in a set, but Djokovic manages to always seem to make the other guy hate life when they try to serve it out against him. A lot of people wilt or get really tight but he generally doesn’t these days and I wish I knew how. I kinda felt bad for Ferrer really since he almost played the exact same way as he did against Nadal except he was just a little to loose at the end. I personally thought he had no chance in either match and was glad to be proven wrong. Maybe none of us will count him out tomorrow. More likely, he’ll go back to folding against the top players but still I have hope for him. Isn’t this Djokovic’s third Masters this year? Unless they stopped counting Monte Carlo as a Masters. You are correct! Until MC gets demoted it is indeed three Masters for Djokovic. Now corrected, cheers. I too felt bad for Ferrer, though I do have some hope he’ll perform well in London. He typically does reasonably well at the WTFs. Final in 2007, semi in 2011, and only very narrowly missed out on the semis last year.